Whether you have never held a fly rod in your hand or fished your whole life – there is a fish with your name on it in the waters of the Sawtooth National Recreation Area surrounding the Ranch. The Sawtooth Valley and Upper Salmon River offer excellent angling options that are not on the radar of even most seasoned anglers. There is a plethora of high mountain or valley lakes accessible by vehicle or foot, with days where no other angler drops even a single line. If your preference is to get off the beaten path, there are hundreds of small streams feeding the Salmon River to explore. The Salmon River and headwaters of the Middle Fork are home to the west slope cutthroat – all eager to take a dry fly. The river also holds rainbow trout, brook trout, bull trout, and mountain whitefish. The valley and high alpine lakes hold west slope cutthroat, rainbow and brook trout. Stop by Stanley Fly Shop nine miles down the road in Stanley, and the nice folks there will talk flies and what’s fishing, all day if you please. As a guest of the ranch you have the opportunity to fish our private, stocked pond for rainbow or brook trout, or fish the Salmon River which runs through our property. We have gear available for the kids for on-Ranch fishing, and local fishing shops have equipment for rent or sale. Whether you need incentive to get started, or are a long-time passionate angler, we offer weekly fishing activities to encourage, instruct, and enthuse. A weekly casting clinic with Riley Berman of Silver Creek Outfitters, and Riley’s “Past the Cast” discussions on the porch one evening a week are complimentary and open to all. Riley’s Fly Tying Class can be scheduled through our office, adding another dimension for the enthusiast. See further details below. With the wealth of information about fishing these local waters available from our staff, local fishing shops and local fishing enthusiasts Riley Berman, Verlon Herndon, and our own Jeff Ballas, you can choose to explore on your own – or we’ll arrange a guided trip for you, guaranteed to provide local color as well as fishing tips. 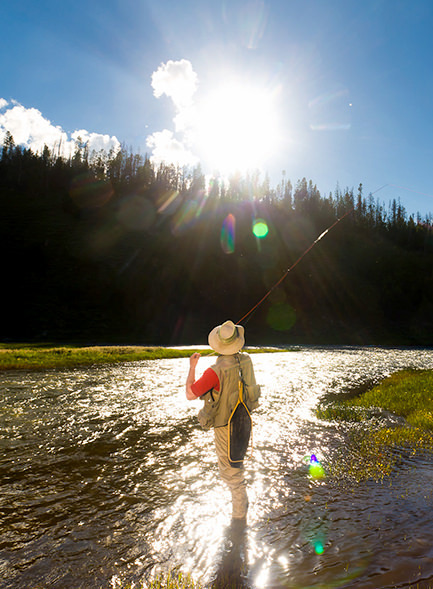 With the backdrop of the Sawtooth Mountains, learn what fly fishing is all about in a casual chat. Riley Berman will share his passion for fly fishing and knowledge of the local waters on the iconic Idaho Rocky porch each Sunday evening. Gear, techniques, fly patterns, local hot-spots, and any fishing topic you’re interested in will be part of the discussion. This is your chance to experience what casting a fly rod is like. In real-time you will learn what it feels like to cast a fly rod and learn the fundamentals of casting — just the skill you need to fly fish. Already experienced in fly fishing? No worries! Riley Berman, local guide with Silver Creek Outfitters, will give you a pointer or two to take your casting to the next level. Casting Clinics are held each Sunday beginning at 5pm throughout the season. Riley Berman will teach you the fundamentals of fly tying so you can continue to tie your own when you get home. You will tie 2 to 3 of Riley’s favorite local fly patterns during the class. After the session you can fly fish our stocked pond or the Salmon River on the ranch property. And, just maybe you will catch a fish on the fly you tied . . . the dream of any angler! Fly tying classes may be scheduled by appointment; fee for participation.